Are your travel expenses getting lost under the seat of your car? Do you stress when tax season rolls around – just when you feel like you’ve recovered from the holidays? This year, get ahead of the game with an easy expense tracking system built specifically for busy agents like yourself. 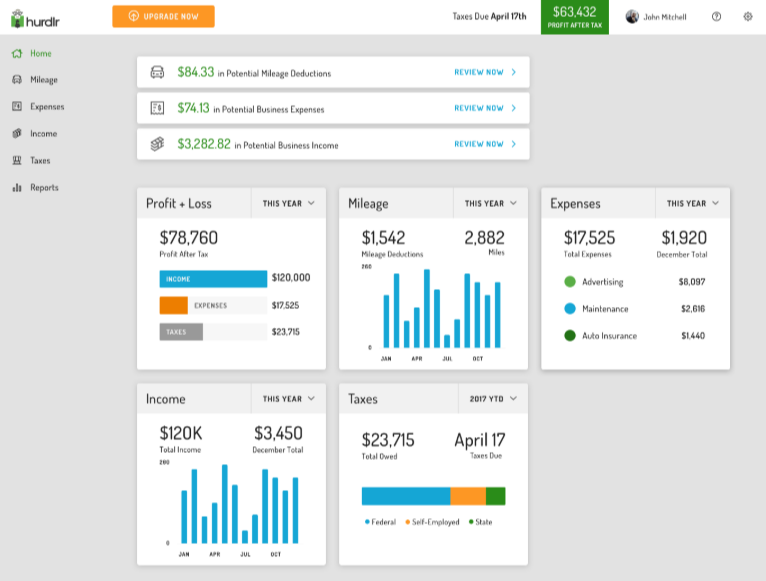 Be prepared for tax season without the hassle of manually tracking each expense throughout the year. Hurdlr is an expense tracking app aimed at helping you eliminate unnecessary data entry and giving you more time to build your business and sell more homes. The app suggests potential deduction amounts, shows estimated taxes due, generates profit and loss statements, and connects to your business accounts ─ making tax time and organizing your financials a less daunting task. With real-time tracking, anything considered a tax deduction, earnings, or expenses are listed ─ all in real-time and calculated in the app. Imagine knowing your profit before and after taxes without having to wait until tax season. By securely connecting Hurdlr to your financial accounts, your expenditures will be categorized by expense type. So, let’s say you swipe your credit card while getting a cup of coffee for your client or potential business partner. You’ll receive a notification on your app that prompts you to “check this as a business or nonbusiness expense,” then the categorization tool automatically organizes the expenses. Another great feature is the automatic mileage tracking feature. When you’re out showing homes, turn on the auto tracking feature. The GPS tracking runs in the background, actively logging your business miles with auto start and stop. Even better, it also lists your potential tax deduction for the miles driven. While many real estate agents use a CPA to help submit their taxes, this app works for you all year long. Keeping track of your business expenses, mileage, and potential saving with your tax deductions has never been easier. Send your reports to your accountant for tax prep or for those not using a CPA, Hurdlr gives you the option to file your taxes via the app. With free access to unlimited semi-auto mileage tracking, basic income and expense tracking, and real-time tax estimates, it makes trying the app risk free. If you like it, then consider Hurdlr Premium. It includes all the free features plus full-auto mileage and finance tracking, speed tagging, detailed tax estimates and calculations for as little as $4.99 per month. To learn more, visit www.hurdlr.com. JoAnna Ellis is part of Academy's Business Development Team, and helps loan officers and real estate agents build their brand through video, social media, and community websites.